This comes from a fellow Anti-Common Core blogger about our schools. Thanks, Danette! Here is a link to the original article on her blog. Under the watch of Superintendent Denise Juneau, students in Montana schools are being taught that Christopher Columbus was an invader, thief, and murderer who sailed the world, not to prove that it was round or to share the good news of Jesus (as Columbus wrote), but ”to secure the tremendous profits that were to be made by reaching the Indies”. The Montana Office of Public Instruction uses Rethinking Schools’ Rethinking Columbus as a resource for instruction in teaching social studies to Montana students — the same book that was banned from Arizona schools last year. In this Montana ‘model lesson plan‘ on Rethinking Columbus, author Bill Bigelow admits he wants to “tell students that they shouldn’t necessarily trust the ‘authorities’”, and that he sees “teaching as a political action…to equip students to build a truly democratic society”. The ‘model lesson’ goes on to give an example of how to engage students through role play. The example explains how the educator (in this case, Bigelow) tells students that taking Indians as slaves didn’t prove profitable enough for Columbus so he sailed to the New World a second time in search of gold and forced the Indians to find it for him. Bigelow, playing the role of the Indians, pleads with the students (playing Columbus) to release them from slavery. Then Bigelow reads passages from Hans Koning’s ‘history’ book which says that Columbus and his men killed or chopped the hands off of every Native American that was unable to find gold for them. 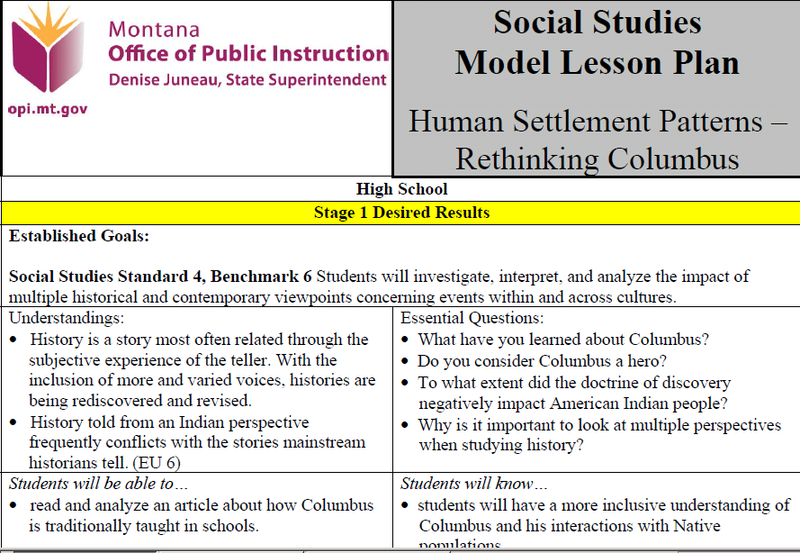 The lesson reveals that the teaching strategies of the Coalition of Essential Schools, specifically “essential questions”, are used in an effort to give students a ”more inclusive understanding of Columbus and his interactions with Native populations”. The Coalition of Essential Schools (CES) is the progressive movement pushed for more than two decades by President Obama and communist and domestic terrorist, Bill Ayers. CES is behind both CSCOPE and Common Core. See the connections here, here, and here. The Montana Guide to Model Curriculum Development reveals that the State Office of Public Instruction relies heavily on techniques of Grant Wiggins and Jay McTighe, both of whom are curriculum developers behind CSCOPE and Common Core. Read more about Wiggins and McTighe and the use of ‘essential questions’ (the language of indoctrination) at ‘Was George Washington Any Different From Palestinian Terrorists…?